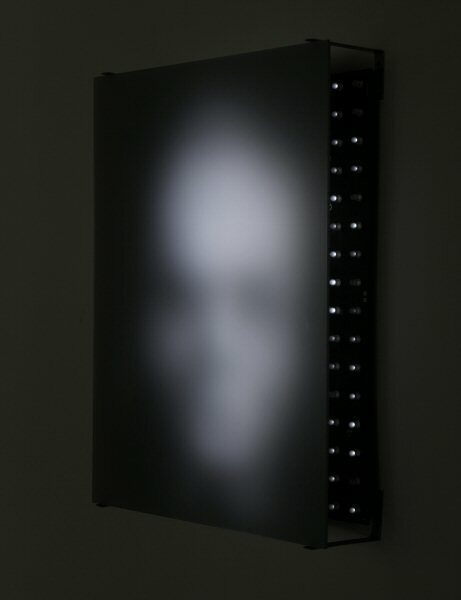 Jim Campbell, Portrait of a Portrait of Harry Nyquist, 2000. Pixels: 192 LEDs, Image: 28 x 36 cm, Depth: 256 levels. Black/white video camera, 50 inch rear projection video monitor, laser disc players, custom electronics. Jim Campbell, Digital Watch, 1991. Black and white video cameras, 50 video monitor, custom electronics, watch. Courtesy of the artist and San Francisco Museum of Modern Art, Doris and Donald G. Fisher Fund. Jim Campbell, Memory Works, 1994-1996. Jim Campbell, Untitled (for Heisenberg), 1994-1995. Eight ultrasonic sensors, salt, laser disc player, computer, custom electronics. Jim Campbell was born in 1956 in Chicago, Illinois. He received degrees in both electrical engineering and mathematics from the Massachusetts Institute of Technology in Cambridge, Massachusetts in 1978, and is currently living and working in San Francisco, California. As an engineer, Campbell holds more than a dozen patents in the field of image processing and is currently working on HDTV-related products in a laboratory in California. Originally a filmmaker, Campbell turned to science after having worked for several years on a personally difficult film on mental illness. Eventually Campbell fused his artistic and scientific backgrounds and in 1988 began creating interactive installations using what he terms "custom electronics" that he designs for the unique purpose of each installation. His electronic artworks have been exhibited in museums throughout the United States and Europe, including the San Francisco Museum of Modern Art, and the Arizona State University Art Museum. 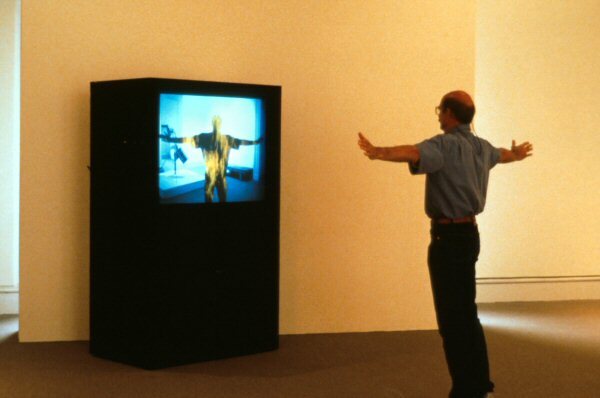 One of Campbell's earliest works, Hallucination (1988-1990) - originally presented at the San Francisco Museum of Modern Art, and later shown in several exhibitions including Le Printemps du PRIM (Montreal, 1991) - plays with the notion of visitor control. The work is made up of a fifty inch monitor, a closed circuit video camera and of course Campbell's custom electronics. In Campbell's quest to create work that challenges notions of viewer control, he has created numerous pieces that deal with desire and power. Shadow (for Heisenberg) (1993-1994) and Untitled (for Heisenberg) (1994-1995) both investigate the Heisenberg Uncertainty Principle which states that nothing can be accurately measured because the object will always be altered by whoever is measuring it. In Shadow , Campbell places a Buddhist sculpture within a glass case. Every time viewers approach the case to appease their curiosity or desire for contemplation, the glass fogs up, leaving the viewers frustrated and unable to see the object of desire. 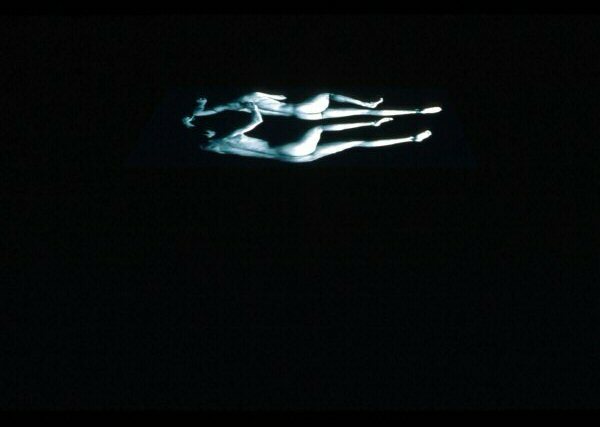 In Untitled, a video of two naked, intimately entangled bodies was projected on a bed of salt in a darkened gallery. Following their voyeuristic instincts, viewers approach to get a closer look. As they draw near, the projection becomes larger and extremely distorted. Once again Campbell challenges comfort levels and viewer desire through works that are both responsive and uncontrollable. In the work Color by Number from the Color Works series (1998-1999), Campbell uses two loaded video images: a Vietnamese monk and a lotus flower in bloom. He extracts a pixel out of each image and enlarges it so that it becomes a single colour field projected on a screen in the gallery. In this way, he links the colour to the image but in an abstract and personally associative manner. More recently, Campbell participated in Vision. Ruhr, an exhibition held in the abandoned Zollern mines near Dortmund, in the Ruhr district of Germany. Simultaneous Perspective (1997-2000) is an interactive video installation that consists of various closed circuit levels. In the former miners' washroom, cameras were installed at various positions, filming architectonic details while at the same time integrating visitor's images into the installation. The images were then arranged to form a live collage in which visitors are confronted with their own presence, the history of the place and the architecture of the exhibition complex. For the first time Campbell integrated exclusively live images into the collage, achieved thanks to the 13 cameras feeding live images to the main projection. In 2000, Campbell also participated in the Ars Electronica Festival and had his work showcased in three separate solo exhibitions held at the Hosfelt Gallery and the Yerba Buena Center for the Arts in San Francisco, California, and at the Cohen Berkowitz Gallery in Kansas City, Missouri. In 2001, Campbell worked on a new series of experimental works called Ambiguous Icons, each work comprising a custom-built display device and electronics. Partly funded by the Daniel Langlois Foundation, the 13 works created in this series question notions of meaning in visual communication. The works explore how different viewing methods and apparatuses (digital-to-analog conversions) might affect the meaning of communication and how such methods can be used as tools in poetic communication. All the works in the series were exhibited during 2000 and 2001. Ambiguous Icon #5 Running, Falling (2000) and Portrait of a Portrait of Harry Nyquist (2000) were featured in the Whitney Museum's Bitstreams exhibition of digital art. Jim Campbell was also included in the Whitney Biennial in 2002, presenting three new works. In 2005, SITE Santa Fe (Santa Fe, New Mexico) organised a retrospective exhibition, Quantizing Effects: The Liminal Art of Jim Campbell, traveling to different cities in the USA. 18 works by Jim Campbell were shown at the Montreal Museum of Fine Arts from September 20 to December 9, 2007, for the exhibition e-art: New Technologies and Contemporary Art, Ten Years of Accomplishments by the Daniel Langlois Foundation. (1) Campbell, Jim, "Delusions of Dialogue: Control and Choice in Interactive Art" (Leonardo, vol. 33, no. 2, 2000) : 133-136. (2) Janine Marchessault, "Incorporating the Gaze" (Parachute, no 65, January, February, March 1992) : 26. (3) Marita Sturken, "Electronic time: the memory machines of Jim Campbell" Afterimage vol. 25, no. 3, (nov./dec. 1997) : p. 9. (4) Margaret Morse, "Threshold Experiences, Incendiary Bodies and Frail Machines" in Jim Campbell : Transforming Time: Electronic Works: 1990-1999 (Tempe : Arizona State University Art Museum, 1999) : 33-34. 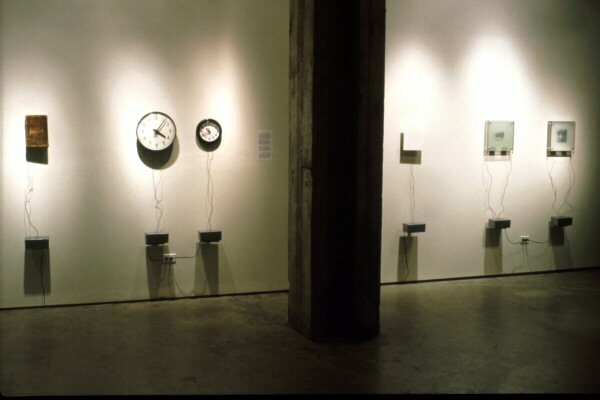 (5) Heather Sealy Lineberry, "Electronic Interview with Jim Campbell" Jim Campbell : Transforming Time : Electronic Works : 1990-1999 (Tempe : Arizona State University Art Museum, 1999) : 65. Jim Campbell explores visual and poetic meaning in the small amounts of digital information that make up conventional digital representation. Keying is a technique for overlaying several video sources onto the same image. To mark the tenth anniversary of the DLF, the MMFA has presented works by ten artists who have received funding from the DLF over the years.